If you are looking for an organization that closely resembles our model, look no further. Bike Works, an organization in Seattle, has an amazing staff and dedicated volunteers that are working everyday to build sustainable communities by educating youth and promoting bicycling. They came down for a visit earlier this week and we exchanged ideas that will improve the reach and capacity of our programs, while sharing what we have learned about how to create an approachable, community-based transportation hub that adds capacity. The national Youth Bike movement is still in its early stages, but it is clear that we need to find ways to engage young people in transportation justice, keep 12-24 year-olds connected to bicycling, and support the next generation of leaders to champion active transportation advocacy into the future. We sat down with Deb and Steve, Bike Works’ Executive Director and Bike Shop Director, to chat about their history, programming, and the bicycle movement in Seattle. Tell me about Bike Works and its history. How did the organization get started? Steve: Bike Works was founded in 1996 as the Free Ride Zone. My understanding is that our original Board of Directors got together and found one person with fundraising experience that created this organization and they found the location in Columbia City in South Seattle. Free Ride Zone was originally charged with recycling donated bikes that may otherwise be heading to a landfill and providing them used or free. Then it developed into an organization that was centered around an earn-a-bike model of programs. Soon after, the name was changed from Free Ride Zone to Bike Works. We opened a bike shop in 1998. The original location is an old, yellow house that had a sidewalk-level cobbler shop in it, so it was easy to imagine where a retail bike shop might go. We’re still in our original location but we recently moved our administrative offices and our two classrooms to a location a block down. Tell us about your youth programming. 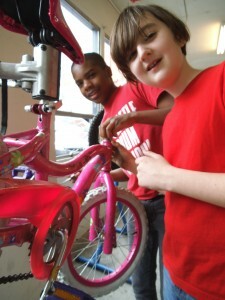 1) Earn-a-Bike, which is during the school year. It’s an 8 week class — beginning, intermediate, and advanced — where youth learn how to fix bikes. When they first fix a bike, it goes to somebody else. After working a certain number of hours, they earn their own. That’s our signature program. 2) There are summer day camps; a lot are overnight, touring camps. The older kids go out to an island or down the coast of Washington for a week at a time. The younger kids go for a few days. 3) The 3rd aspect of our youth programming is partnerships. There’s a lot of different schools that come to us and want to do different things. Sometimes they are designed specifically for that school or community organization. How do you keep youth engaged in bicycles as they grow older? Deb: We create a lot of opportunities where you can keep coming back in a leadership role. There’s also a formal apprenticeship in the shop, once you get to that point where you really want to go down this road. Steve: Youth who have gone through Earn-a-Bike have put in 40 hours with our program staff, and have gained some skills to be able to work in a bike shop. Then they will do a 60-hour apprenticeship in the bike shop, after which they could become a summer hire in the bike shop or eligible for hire. One of our full-time staff has gone through that program, and got UBI certified along the way. We also have a program that we are in the process of raising money for — Bike Works Mobile is what we’re calling it — a mobile repair shop. It will have a job skills training and youth development aspect, defining youth in this case as 18-24. Deb: We have youth involved in the governance of Bike Works. We have youth that sit on the board; we have two seats for them. Then there’s a Youth Advisory Committee that advises those youth board members. That club is run completely by the youth so no adults are even there. That’s a new element that we’ve put into place in the last year. How would you describe the bicycling world in Seattle? What do you think the primary barriers to bicycling are for the communities that you are working with? Steve: The bike scene in Seattle is really diverse, just as diverse as I know it is in Portland. People are using bikes for all kinds of reasons: fitness, fun, racing, and transportation. I think that in the communities that Bike Works is serving, we’re in a zip code in South Seattle where over half of the households speak a language other than English. Deb: The biggest barriers to bicycling in Seattle? Hills. The infrastructure in Seattle is one of those things where it tries to make strides but it isn’t quite there yet. On the advocacy side of things, the City is trying to pay more attention to the “Wary but Willing.” They have a name for this person; they call her Wendy. They say that women are sort of the indicators for how safe the roads really feel. Women are going to be biking if it feels safe. What’s next for Bike Works? Deb: The next big project is the Bike Mobile, launching that and getting that on the road. We’ll be able to amplify our message, do the job skills training, and be able to fix bikes in neighborhoods where people don’t have access to get to our shop. To the south of us, for about 10 – 15 miles, there’s no bike shops. It’s what we’re calling a bike desert. Thank you, Deb and Steve, for taking the time to chat with us. We look forward to strengthening the ties between the Community Cycling Center and Bike Works in the future.